We are proud to announce that issue 60 of Lights Go Out releases next week! 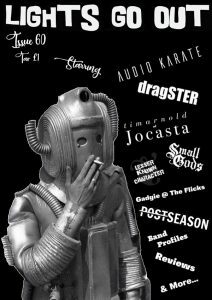 Featuring chats with Audio Karate, dragSTER, Tim Arnold of Jocasta, Lesser Known Character, Post Season and Small Gods. In this issues Gadgie @ The Flicks, Marv talks us through “Hotel New Hampshire”. Rammed with stacks of music reviews as always. Band Profiles: Binge Drinker, 6foot7, Codename Colin, Sad Sally, A/M, Cat Dail and Next Year. Once again, thanks to every single one of you for supporting the zine, it’s much appreciated.